Deciduous large shrub or small tree with profuse crepe-like coral (watermelon) colored flowers. Exquisite orange-red foliage color in the fall. Smooth, mottled, light cinnamon brown bark adds year-round interest. Use for accent, background, specimen or street tree. Zones 4-9. 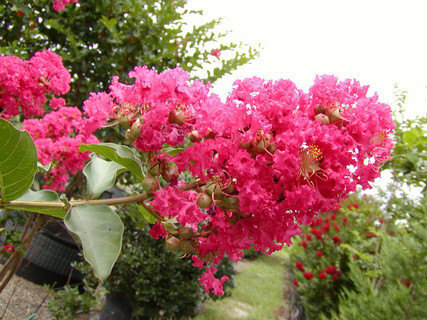 • One of the hardiest crape myrtles available. • Resists mildew – no messy fungicide sprays! • Highly drought tolerant. • A truly "care free" tree. Crape Myrtles are excellent specimen trees, as well as natural privacy barriers. Many customers choose to line their driveways with this stunning tree. Currently shipping 5-10 inch plugs. First picture shoes the flowers when they bloom, Second picture shows the plant as the form we ship a "plug", and the third picture shoes a plant zone map in case you don't know which zone you are.